Even when these symptoms are not visible, underlying periodontal or dental disease may still be present. Undiagnosed, dental problems can lead to additional medical concerns, including an increased risk of tonsillitis and pharyngitis. Likewise, bacteria absorbed into the bloodstream may be carried to other organs, causing heart valve infection or kidney and liver problems. Fortunately, your veterinarian can detect underlying dental problems during your pet’s regular examination. Periodontal disease is the inflammation or infection of the tissues surrounding the teeth. It often starts with tartar accumulation on the tooth. The tartar then causes the gums to recede around the base of the tooth, enabling infection to take hold. With the infection, gums recede further allowing the infection (if untreated) to spread into the tooth’s socket. From there, the tooth will often loosen and ultimately fall out. Your pet’s mouth is home to thousands of bacteria. These bacteria breed on the surfaces of the teeth, forming an invisible layer called plaque. Some plaque is naturally removed by your pet’s regular chewing and tongue actions. However, the plaque that remains begins to thicken, becomes mineralized, and ultimately visible as tartar. Plaque mineralizes in some dogs much faster than others. Special canine toys, newer dental diets, and home care-tooth brushing can help reduce tartar build up. However, once tartar has formed, it can only be removed professional scaling and polishing under anesthesia. In dogs, less than 10% have problems with decay. 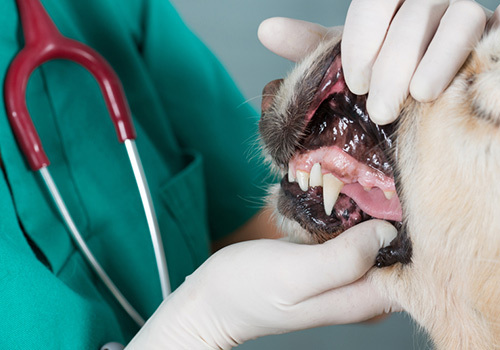 Rather, the majority of canine dental problems are caused by periodontal disease. In fact, periodontal disease is by far the most common canine disease, affecting over 68% of dogs over three-years old). Because dental work is done under anesthesia, pre-anesthesia blood tests will be required to ensure that kidney and liver function are satisfactory. Likewise, antibiotic treatment may be initiated before full dental prophylaxis is conducted. Please schedule an appointment for these tests as well as for an examination of your pet. Please provide us with a telephone number at which you can be reached while we conduct the procedure in the event additional procedures are needed (see below). Once your pet is comfortable and anesthetized, the dental procedure will begin. For a thorough cleaning, tooth scaling will be performed using hand instruments as well as ultrasonic cleaning equipment. This technique will remove tartar from above and below the gum lines, the latter which causes the most significant gum recession. Once scaled, the teeth are then polished to prevent subsequent plaque build-up. In some cases and depending on the conditions of your pet’s teeth, additional procedures (i.e., extractions, fluoride applications, etc.) may be required to decrease tooth sensitivity and strengthen enamel. Plaque and tartar can begin forming in as little as six hours after your pet’s dental cleaning! Accordingly, we recommend that you immediately begin a home dental care program for your pet. When you pick up your pet, we’ll provide you with detailed instructions on how to brush your pet’s teeth. As a cautionary note, do not use human toothpaste for your pet. These foaming dental products are not intended to be swallowed and may contain sodium, which can cause problems with some pets.